Madeline Hamblin, Director of the Office of Graduate Affairs (fourth from left) joins some of the 18 graduate students who won Fulbright-Hays Doctoral Dissertation Research Abroad fellowships for 2006. Chicago students continue to garner record-breaking numbers of Fulbright-Hays Doctoral Dissertation Research Abroad fellowships, which the U.S. Department of Education awards annually. For the 20th consecutive year, Chicago students have won more Fulbright-Hays DDRA fellowships than any other U.S. educational institution. This year, 18 of 32 Chicago applicants have received fellowships as of this printing. Last year, 28 of 42 students received the fellowships, and in 2004, 23 of 34 students were recipients of the awards. The dissertation fellowships are for study in non-Western countries and cover periods of six to 12 months. 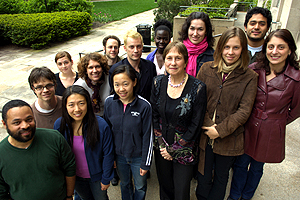 The following students, who are 2006 fellowship recipients, are named with their areas of study and the countries to which they will travel to conduct their research.